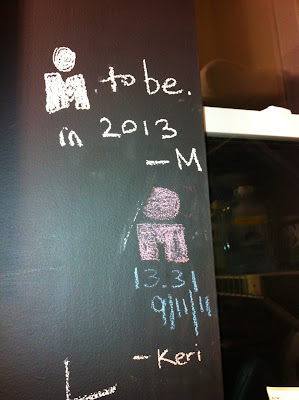 Melissa Stockwell (www.melissastockwell.com): I'm going to be an Ironman. I'm going to be an Ironman. We all have a bucket list. Some things stay on that list and never get crossed off. Others are put on there and easily completed, just for the satisfaction of crossing them off. An Ironman has been on my list for years. Since I've been in the world of triathlon, I've learned and experienced the coveted Ironman club. An exculsive club reserved for people who choose to subject themselves to a lot of training, some pain, but the ultimate goal of crossing that Ironman finish line. It's a badge of honor to wear the Ironman (IM) logo whether it's on a jacket, a visor, or the commonly seen tattoo, an M-dot some call it as it's an M with a dot at the top. If you're in the club you're automatically one of the cool kids and there's this silent pact with all the other finisher out there. A sly head nod like an all knowing secret that only the finishers have. Now, let me continue by saying I did not sign up for this feat to be a cool kid, I mean let's face it, I've been out of that club for years. I simply signed up knowing that was the first step, and wanting to prove to myself that I was capable of such a feat. That and because I told my friend Keri, and wrote it on a chalkboard painted wall on New Years Eve last year at someone's house I didn't know that I would in fact to an Ironman in 2013. And I just can't let myself down like that. If you say you're gonna do it, do it right? Another piece of info: Paratriathlon will debut in the Rio Paralympics in 2016. Every year up until then there is nationals and World Championships, which are all sprint distance. Many coaches will tell you that training for a sprint distance race and an Ironman at the same time it tough. Either your speed suffers or your endurance suffers. As long as I continue to love the sport, and my body holds up, my plan is to compete in Rio in 2016. But as we all know, life continues after the sport of triathlon, and in my head, 2016 will perhaps be the end of my triathlon career at the elite level, knowing full well that it will always be a lifestyle, just of a different kind. So I wanted to do an Ironman prior to 2016 and this next year 2013, was the year to do it. I will train for an Ironman and if my sprint distance races suffer, so be it, I've made my choice. And after I race and become an Ironman, I can go back to the short races and still have a few years to get my speed back up before qualifying for Rio in 2016. Many of you have probably heard of the Kona Ironman. It's the Ironman of all Ironman, the World Championship that has an emotional, heart wrenching 2 hour special after the event. I used to think that was the only one I would want to do. But. It's not. Each Ironman is the same distance and you need the same iron will to finish the thing. So when I got a call from my friend Jean Draper, a fellow amputee, that she was signing up for Ironman Arizona for Nov 17, 2013 I thought for a few minutes and thought, sure, why not? I consulted Brian, my coach Stacee, and a few others as I can't seem to make any big decision on my own. I got their support and I went for it. What's even crazier is that this crazy race sold out in 40 seconds. Yes, 40 SECONDS! I didn't get the initial spot, but when other spots, twice as expensive, became available for a short time, I was able to snag one of those. Now I have the pleasure of paying $10 for every mile I will complete, figure out the math, it's not cheap! But on Nov 17, 2013 in Tempe, AZ I will have the chance to become an IM! And so begins my journey. As in all IM races, each segment will have a time cutoff and I'll have to make the swim and bike cutoff time to be allowed on the run. If you don't make the cutoff, they pull you off the course and you get the not so great DNF (did not finish) next to your name. My goal? To finish of course, and become part of the coveted club.If you've read my past entries, you know that I've completed a few 1/2 IM. Now the challenge of doubling that effort and having what it takes to get through it! nice nice nice! all the best for you! enjoy the trainings and the pain! as they say "pain is weakness leaving the body"
I'll keep checking your blog to see how your journey goes! First, thanks for the service and sacrifice you have given us. I find your story to be very inspirational and I am glad to see that you have overcome a situation that has left others hurting for years. You truly are amazing. I will follow your journey in the coming year. Ciao Ho letto la tua storia. Ti stimo. Buona fortuna.